For anyone who may have followed the news about missing hiker, Tom Lang, 22, last year around Christmas, here is an update. My heart goes out to Tom's family and friends, but I'm so glad he was found. His parents' perseverance was ... well, what can I say? Rest in peace, Tom. I know it's been ages since I've posted anything here -- life has been so busy, so I've had to let some things slip ... including blogging -- but (*waving like a nut*) I'm still here and still loving being part of SAR in general and proud to be a member of this wonderful team of volunteers here in Coconino County. Matter of fact, I intend to keep at it for as long as I can be of any service in some capacity, which hopefully will be for decades to come. So, there have been many missions since I last posted, a few that took me into part of this amazing county where I've never been (Paria Canyon, Havasupai, Sundance Canyon) and others in places that have become so familiar over the past six years that I've been on the team. I haven't been able to respond as often as I used to because of other obligations and a few vacations, but I'm doing as much as I can as often as I can and looking forward to helping with the new member academy coming up soon. American Canyoneers has launched a fund raising campaign to help the team help us. These funds will be used for the purchase of critical equipment and training for team members. How can you help? Easy! Come watch a few great films about canyoneering! Along the way you’ll see a presentation by the SAR team about the rescue in Insomnia Canyon, certainly one of the most difficult slot canyon rescues ever. You’ll be stunned at the effort the team had to put into saving one life. Join us in Flagstaff on September 17th at the Orpheum Theater or in Tempe on September 18th at the Pollack Tempe Cinemas. 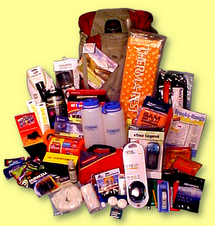 Have fun, celebrate our favorite pastime, learn how you can avoid being the next victim, and support our SAR team. Climb on. Okay ... I can do that. Sort of. I did a little of this (once) with the team at the Mt. Elden climbing area and got, oh, maybe 10 feet off the ground -- felt like 100 feet to me -- partly by wedging my face into a crack. Probably a deduction in style points for that move. 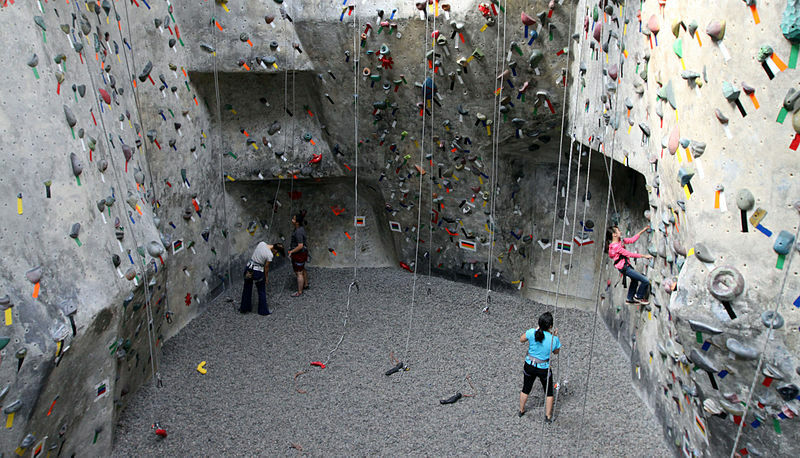 This time, we were at the Vertical Relief Climbing Gym here in Flagstaff (not the place pictured above), getting some special instruction from two of their experts, happy to be training IN-doors on that cold, rainy Sunday morning. This was training specifically to help us with "buttom-up" rescues, when we can't access the rescue-ee/s from above, which is the norm for our team. But we do come across situations, as recently happened on a rescue down in Sedona (see link to news article below), where some climbing comes into play when there's no way to rig rope systems from the top. A number of our tech team members are already good climbers, and I believe at least a couple of them would be considered expert level themselves. Others are very competent. But there are some -- especially me -- who are new to this bottom-up "stuff," so this was very valuable training and not the last we'll do. We were given an excellent intro to top rope and lead climbing techniques, as well oh-so-important belaying skills, which are different, of course, from the bottom than they are when belaying someone on rappel or who's ascending or being raised from above. Needless to say, I'm much more comfortable belaying than BEING belayed while climbing. Sure, I still have my share of nerves when I go over the edge from the top (always will, I think), but climbing up is another story. Instead of being able to put my weight on the rope and trusting the system when working from the top, climbing makes me feel like I'm always on the verge of falling, even though I know someone's "got me" and that things have been safety checked. I was not good at it. I was scared, and I tossed what pride I have out the window. But every time I learned something new (different ways to use the handholds, how to shift my weight, etc.) 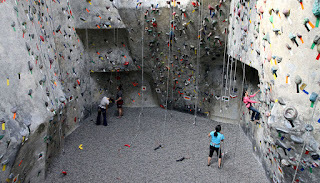 ... and every time I got higher up the wall ... and when I made it downclimbing all the way back despite my shaking muscles (from nerves and the fact that I don't use some of those muscles much), I felt just a tiny bit more confidence creep in. Part of me really wants to learn how to climb -- mostly at the gym -- just to get better at something that is so NOT a natural talent for me, that challenges me both mentally and physically, and something that makes me face my fear but in a safe way. I think I'll put that on my to-do/wish list. So, I think I'll start saving my extra pennies and eventually take some lessons. In the meantime, though, I'm actually looking forward (in a nervous, insecure kinda way) to more of these bottom-up trainings with the team. I know it's been a while since I've written anything here, and the reasons are many-fold, including the fact that we just haven't received as many SAR calls over the past several months as we did before that, during my five years and counting on the team. And that's a good thing! It may be that more calls have been resolved by Sheriff's Deputies before they've gotten to the point that the team was needed and/or perhaps fewer people have gotten into bad SAR-type situations recently ... at least, in our area. But whatever the case may be, my phone hasn't rung nearly as much with "SAR" showing up on the display. Suffice it to say, some of those missions haven't dealt with happy endings like the one that just happened yesterday, when a 7-year-old boy who'd been missing since approximately 10am the day before was reunited with his family after an extensive search that included Search & Rescue teams from several counties, with ground-pounders, K9 and mounted units, jeep posses, and air support from DPS, the Air Force and perhaps other agencies I'm not aware of, along with many locals who came out to help search. Cole Evans had spent a long, cold night alone "out there," under an abandoned trailer, so we learned when he was finally located around 9-something the next morning. Here's an article about the search, with some great photos, including a touching reunion with Cole and his dad. Cole Evans Found Alive and Well! All I can say is: YAY!! What a huge relief. As I was searching through much of the night with my field team, I kept noticing the cold -- at freezing or below with snow still on the ground among the pinion, juniper and cactus -- thinking about Cole and wondering if he were cold and scared. As we searched beneath trees and up in the branches, and under and inside abandoned vehicles and trailers, I kept hoping that someone would say over the radio that the boy been found. It didn't matter who found him of course -- just that he was safe. As my group debriefed back at Incident Command in the middle of the night, I looked over at the house Cole should be in, warm and safe. I saw the lights on and thought about what the family inside must be going through. As my search partner and I drove away, talking to ward off the need for sleep after our shift, we saw lights of searchers' headlamps glimmering in the distance, the headlights from searchers' vehicles, red and blue flashing lights from law enforcement vehicles, lights in the sky from searching aircraft, and we wondered if Cole was seeing or hearing any of that. Needless to say, I was so relieved to hear, later that morning after I'd gotten some rest and pulled prickly pear spines out of my socks, that Cole had been found, and that he was "fine" and eating snacks. I started to see the happy announcement posted all over social media, where people had been sharing search updates from the media and worrying together about the boy. Thinking about recent missions that didn't have a similar outcome, this one left me with a very big smile and a happy heart. Let's hope the trend continues. It's one thing to learn about Search & Rescue Operations ("Ops") and the Incident Command System in the classroom and do practical exercises with other SAR Ops students; it's quite another to actually do those things ... or assist anyway ... in the field. Although I've responded to a few Ops Leader call-outs for mission start-ups (to help the Coordinator before a general call-out is made), I had my first "real" chance to help with field Ops during our team's recent mock search for the annual new member SAR Academy. Actually, I was asked to lead the exercise, and, though I didn't have the experience necessary to act as Incident Commander, even on a "pretend" mission, I agreed to step up and do it. I wanted to jump in and get some of that real Ops experience, mock search or not. The purpose of this field exercise, held at the end of the SAR Academy, is to give new members an idea of what a mission is like, from receiving the call/email/text message, to calling in to the SAR line with their name and badge number, to responding to the SAR building and getting all equipment, radios and vehicles ready to go, to the briefing and strike team (or task force) assignments, to working with other team members in the field including navigating and handling radio communications, to documenting and relaying information about clues, to coming up with an evac plan and moving the subject/s out of the field, to the debrief and other aspects of wrapping up a mission, particularly the "hasty" search phase which is when the majority of missing/overdue subjects are located. The field exercise gives new members a chance, with the help of experienced team members, to put together all of the skills they've learned during the academy and put them to "practical" use. All I can say is, I'm grateful for the help and support of a few members of the team who have a lot more Ops experience than I do. While I was able to facilitate the planning (I'm good at sending out emails!) and help carry out this field exercise--a search for two overdue subjects in a wooded area near Flagstaff--there was much I didn't know how to do or that would have taken me too much time to figure out on my own: I didn't know how to work the computer program to create the specific maps we needed for the briefing packets; I would have taken a lot longer to come up with assignments for all of the field teams, both ground SAR and mounted, on my own; and I would have been overwhelmed as the IC. So many things going on all at once, and many of those things in constant flux. To expect that a mission--even a mock mission where we pre-plan the locations for our "missing" subjects to be found--will go off just as planned from beginning to end would be to expect the nearly impossible, as I see it. I could lie there in bed at 2am (as I did one night when I couldn't sleep) and imagine the whole thing, from call-out to de-brief at the conclusion of the search, as a nice, orderly mental movie. In reality, though, things didn't go quite as I'd imagined (or planned) starting right from that call-out, which was sent to new members and those experienced team members who'd volunteered to help as "observers" in the field. After the call-out was finally made at about 8:10am, it took longer than expected for everyone to arrive at the SAR building. And an assignment was changed last minute. And the unpaved Forest Service road the Mounted unit members had to drive on with their horse trailers and horses to get to their start-point turned out to be in much worse shape than expected (compared to the last time any of us were out there). And the shuttling of ground-pounder "strike teams" was rather complex and time-consuming. (Did I mention some of those roads are really bad?) And that "jeep track" shown on the map--the one where I instructed one of our subjects to leave a clue she was given and then, further along that jeep track, to hang out with her mock ankle injury and wait to be found and rescued--well, that wasn't really there anymore, so she couldn't find it. And the list goes on. One thing I had some good practice at during this process was delegating. And in some cases, I didn't really have to ask. The team members who helped me with the planning gladly offered to take on tasks, and I went from one to the other, looking over their shoulders, helping where I could, asking questions, and listening and watching and learning. Then, when the call-out was made, we had the added help from those experienced "observers," who gave direction to the new folks as they arrived at the building, helped them understand their assignments and find their starting points on the maps, directed them in loading up equipment and preparing to leave the bay, and with all other aspects of the mission. Me? Oh, I ran around a lot. And shuttled searchers and eventually the Stokes litter and medical supplies to the evac team. And assisted at IC as information came in over the radio and teams in the field asked for direction as the search went on. 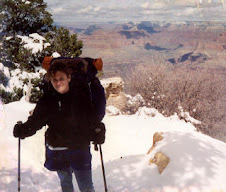 I didn't do any hiking that day, but, wow, when I got home I sure felt like I'd walked miles. All in all, the field exercise went well, and I think--hope--all new members got something useful out of it. Actually, I'm sure they did, including better understanding the fact that we all need to be flexible during missions because things are continuously changing and that sometimes we get assignments that may seem "boring" or "useless" but that are actually vital to the mission, including doing containment and also finding out where a missing person is not. There were new members who actually said those things to me--that the field exercise helped them better realize those aspects of Search & Rescue--and that definitely was good to hear. So, I'm holding on to the briefing packet and the notes I made this time around and want to participate with planning and Ops again next year, hopefully by then with more confidence and skills I can bring to the table. One thing's for sure, though, I now have an even better appreciation for how challenging SAR Ops is and really admire those who can handle sometimes very stressful and complex missions so well. It can be easy to comment from a searcher's point of view on how things are managed and carried out, but putting myself even just somewhat in the position of a SAR Ops leader has given me a whole new perspective. Not to mention the desire to get a whole lot better at it. Isn't he a beauty? 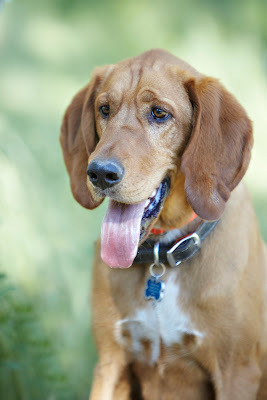 This is Tank, a two year-old Bloodhound/Labrador Retriever mix, owned and loved by his handler, Diane, who's been involved with Search & Rescue for many years. Diane is retired from law enforcement, where she worked with SAR and with police detection dogs for explosives and tracking. She got her first tracking dog in 1992. Tank is her third hound. Tank, a rescue dog out of a shelter in Los Angeles, CA, is actually a tracking canine with a trailing certification. This means that our team is now fortunate to have both a tracking/trailing dog and three cross-trained air-scent/human remains detection dogs to assist with our missions. All the dogs and their handlers train (which is like play time to the dogs) at least a few times each week to keep up their skills and their fitness. Tracking Dogs -- This type of SAR dog works from a scent article which has the subject's odor on it, such as a piece of clothing or hat, a pillow case, a hair brush and so forth. The dog picks up the specific human scent from that item and uses it to locate the path that person took. Tracking dogs generally work on a long lead, taking the handler to the subject by following the missing person's footsteps. Trailing Dogs -- Trailing dogs work in a manner that's very similar to tracking dogs. 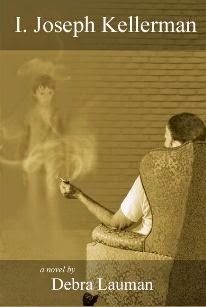 A scent article is carefully obtained in order to isolate the missing person's scent. 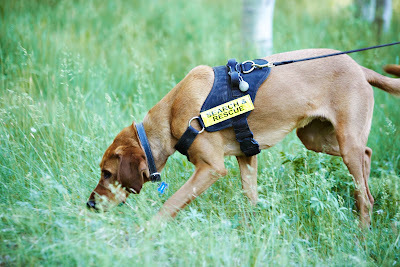 The search dog then smells the scent article and uses that smell to find and follow the path the person took. With trailing dogs, though, the dog might veer off the missing person's actual track, cutting corners and using the wind to its advantage. Trailing dogs generally work on a 20- to 30-foot lead. Air Scent Dogs -- Unlike tracking and trailing dogs, air scent dogs work off lead, ranging back and forth to pick up human scent. ANY human scent, that is, which is why it's important to test wind direction and, as much as possible, keep other people (ie. searchers) downwind of the dog while its searching an area. Ranging often takes the air-scent dog out of the handler's sight for a time, so the handler must trust the dog and wait for an alert. Once the dog picks up human scent, he or she will move in towards the source and then must give an "alert" to the handler. That alert might be barking while staying with the source of the scent or might be done by returning to the handler and somehow conveying to that person, "Follow me!" The dog then leads the handler to the subject. In general, air scent dogs are not scent-discriminating the way tracking/trailing dogs are, so scent articles are not used. Rather, the air scent dog will seek out any human scent and alert the handler. If the human who's located is not the subject, the handler can reward the dog for the find and then give the command to continue searching. There are variations to the above, but those are the basic ideas. Climber Injured in Oak Creek Fall: A 43-year-old Flagstaff man fell about 40 feet while climbing near the Oak Creek Canyon overlook on Monday. A tourist saw the man fall and called 9-1-1. A technical rescue followed, with cooperation by crews from Coconino County Search & Rescue, the Sedona Fire Department, and the Highlands Fire Department. Crews Search Oak Creek for Missing Minnesota Man: 27 year-old Shaun Rentz of Minnesota was reported missing after he failed to meet with friends over the weekend and then didn't show up to move in with friends at their new home in the Twin Cities on Monday. His abandoned vehicle was then located near Flagstaff, Arizona, at the Oak Creek Canyon Overlook parking area, later that same day. Here is another article with additional information and a photo of Shaun: Car of Missing Twin Cities Man Found in Arizona. Any questions about these or other SAR missions in Coconino County should be directed to the Coconino County Sheriff's Office. I was supposed to go to a day camp with three other SAR members, to help teach kids ranging in age from five to 12 how to use a compass, what makes a "good pack" versus a "bad pack" (that is, gear you should bring on a hike versus stuff to leave at home), and how to not get lost or to "get found" if you do. We went to this summer camp last year, and our program was a hit with campers and camp leaders both, so they'd asked us to come back. And I was going to, until right before I was supposed to leave the house. That's when there was a call-out for a rescue -- possibly a technical rescue, the message said -- in the Dorsey Springs area of Sycamore Canyon. So, per the request of the deputy coordinating the mission, I bailed on my teammates going to the camp and responded to the rescue instead. Late the night before, there had been a call-out for the search for this 41 year-old overdue hiker who now needed rescue. I hadn't responded to that call because of my prior commitment to the camp program in the morning. Apparently, this man was at least a day overdue when a concerned family member had reported him missing, and his vehicle had been located by deputies at the Dorsey Springs trailhead. Just after dawn, searchers had found him down in the canyon, severely dehydrated, weak and disoriented. By the time those of us responding to the rescue call later that morning had arrived at the trailhead, the hiker had been hydrated and slowly walked with aid partway up the trail. At that point, the man said he couldn't walk anymore. The two deputies who were with him requested assistance and more water. Several of us hiked in with supplies to meet up with them. When we arrived, the man was sitting under a tree. He drank some Gatorade and spoke to one of our teammates, who's a paramedic. The man said he was okay except for being dehydrated and clearly explained what had happened over the past several days. The searchers who'd found first his backpack and then, maybe a few hundred yards away, the subject filled us in on his state of mind and actions at the time he was located. He'd made quite an improvement after having something to drink and eat. Sadly, the two dogs he'd brought on the multi-day hike -- adult, black-colored boxers, a male and a female -- were nowhere to be found. They'd stopped following him at least a day and a half earlier and laid down in the shade. Had they had enough left in them to find their way back to the last water source they'd been at with the man? I hoped they had. And that they'd survive long enough for someone to find them. I was preoccupied by those thoughts as I watched the short-haul procedure, when the man was short-hauled to the trailhead. He refused medical transport by the waiting ambulance. See the Sheriff's Office media release about this rescue. Also, see the media release about two other recent rescues, these in Oak Creek Canyon, conducted in part by the Coconino County Sheriff's Search and Rescue team. Update: I've been told that one of the two dogs that had been lost in the canyon has been located alive and returned home. The other has not been found yet. So keep an eye out if you're down there! I was tired. When the call came in from SAR, I was sitting in a Lay-Z-Boy being very lazy. It was around 9pm, and I was ready for bed. I listened to the short message about the mission, looked at the text that came through seconds later, and put the phone back down. "Not this time," I told Jeremy. But then, two minutes later, Cindy, our K9 handler, called me directly. Our Coordinator was requesting the dogs, and would I be her backer, she asked? *sigh* Okay, for Cindy I would go. So, I met her at the SAR building about 20 minutes later and loaded my gear into her vehicle to the tune of three excited Golden Retrievers. They'd already hiked several miles earlier that day, but they still seemed rearing to go. The two of us two-legged creatures, though? Not so much. We got our brief briefing -- a 70-year-old gentleman with what sounded like a moderate level of dementia (possibly Alzheimer's) had now been missing nearly 24 hours after driving someone else's vehicle to the very rural area where he lives, then left the vehicle in the trees near a dirt road and walked off. This was not the first time he'd gotten lost while trying to go home. Cindy and I left the building ahead of our teammates, as they got some additional gear ready. We were supposed to rendezvous with two deputies, who were at the location where the abandoned vehicle had been found. That was now the Initial Planning Point (or IPP). From there, we would begin our search with the dogs, and the other volunteers would soon follow. When we found our way to the waiting deputies through a network of dusty roads and jackrabbits (actually managed not to hit any as they streaked across the murky beams from the headlights), we consulted with them (the deputies that is, not the rabbits) about what had -- and had not -- been found and determined the area we thought was the highest probability. Then it was time to let the excited dogs out to do their thing: search. "Your assignment," Cindy half-whispered to the three wet noses that turned her way, "should you choose to accept it ... is ..." After the usual dramatic pause, she shouted, "Go find!" Three golden tails shot off into the dark as we followed much more slowly. We would walk the grid, and the dogs would range around us as we moved. As the backer, it was my job to handle radio communications, navigate the grid within our search area given the information from Cindy about wind direction and instructions about how she wanted to work the dogs, and keep us all on track. "Go a little more left," I would say. Then, "Turn a bit more to the right," as I stayed behind and to the side of Cindy, trying to make a pretty little grid on my GPS while still looking around. In the light of my headlamp, obscured by the dust we were kicking up as we walked across bone-dry ground, I tried to manage the topo map and my GPS without walking into a pinion, juniper or Ponderosa pine or tripping on rocks, dips, and forest debris. Needless to say, on more than a few occasions I had to say to Cindy, "I need to stop to get this figured out. I can't walk and try to read a map and GPS at the same time." Yeah, I was moving and searching and calling the subject's name, but I was cranky too. I was also still frustrated, because it had taken awhile for me to get myself oriented that night, out there in the fairly flat and, aside from one major drainage, often featureless, forested terrain. Even when I had my map oriented to the way I was facing, the mental picture was alluding me. And the frustration only confused me more. After talking to myself, though -- aloud for anyone to hear -- and working it out ("Okay, this is that road," I said, pointing towards my feet and then to the map, "and this is that road ... so, okay, we're right here, and we want to go that way....") the mental picture finally appeared and cleared. So, on my mark, we were ready to go. Anyhow, this whole K9 handler/backer thing is SO much about communication, and though we sometimes get cranky -- one or both of us at the same time -- Cindy and I really have learned how to talk things out, to problem-solve and reason and get back on track when we get a bit off. We've also worked through temporary miscommunication and misunderstanding without getting all unglued. The more we work together, the better we get as a team. I like that! Well, long story just a little shorter, we did lots of walking throughout the night and into the next morning. We also did lots of calling out for the subject. The dogs worked their tails off. And we saw, to our pleasure, that one of Cindy's dogs, who'd originally been trained as a tracking/trailing dog and later switched over to air-scenting, reverted to tracking/trailing when the opportunity -- human scent on the ground -- presented itself. And, sure enough, we found footprints. Good dog! But we weren't the ones who actually found the subject. It was a friend of his who found him, safe and asleep in the corner of a room in his own home, just after Cindy and I were released to return to Flagstaff later that morning. The man we'd been looking for for nearly 12 hours had apparently found his house sometime during the night, after the friend who was supposed to stay in case the man showed up, had left to return to his own home. Well, all was well enough that ended well. The man was okay and, for now at least, home safe. A couple of hours later, after insisting to Jeremy that I can't sleep during the day, I was fast asleep on the living room floor. It was a bright, sunny day in Flagstaff, but I was nervous about going up that mountain I've hiked so many times before. The nerves were because that clear Spring day was unseasonably cold and extremely windy in town, more than 5,000 feet lower than up on the exposed ridge. I have what I think is a healthy respect for those conditions, which made me pause to reconsider them when our Coordinator walked over to those of us who'd congregated at the base of the trail and said no one was obligated to go up if he or she didn't feel comfortable or prepared. I quickly looked through the extra clothing in my SAR pack, now adjusted for warmer weather, and decided I had just enough (thermals, fleece, and Gortex) for the freezing temps we'd face up there. But I was still on edge about the winds, which would be much stronger on the ridge. Ultimately, I decided to go up with my teammates. This was to be a body recovery, unfortunately. Our team knew that before we'd left the SAR building, where a group of us had been in the midst of a Saturday technical rescue training. Others were doing PSAR (Preventative Search& Rescue) in a popular ATV area which always sees a lot of activity and often a number of accidents over the Memorial Day weekend. A couple of those SAR volunteers also responded to this mission on the mountain. We'd been informed that a couple of hikers had come upon an unresponsive man a short distance from the 12,633-foot summit of Mt. Humphreys (I couldn't imagine why people would choose to go up that mountain on a day like this, sunny or not) and immediately began CPR. One of the hikers continued to work on the victim while another called 911, given that there's cell phone coverage high on the mountain. Sadly, after about half an hour of effort, CPR was unsuccessful. No one knew, at that point, how long the then-unidentified man had been down when the hikers found him. What was obvious, however, when our team, including our Coordinator who hiked up with us, arrived at the victim's location was that he was a runner. 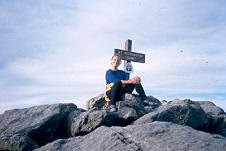 And that's what he'd obviously been doing -- an early trail run to the summit -- when he'd died among the rocks and rime ice. None of us recognized this man, who we eventually found out was from Goodyear, AZ. He was 53 years old (so we also later learned) and appeared to be exceptionally fit. In fact, he'd recently run a marathon and was, according to his family, doing high-altitude training here in Flagstaff for an upcoming event. So said the news article I read a few days later. I'd been scanning the paper each day for any information. At the time of the mission, though, I looked at this man for long moments every now and then, thinking, Who are you? And who might be waiting for you at home? When this man, lying on the rocks, had woken up that morning, I was thinking, it had probably been a day like most any other day. Or so he'd thought. I'll bet he had been feeling fine. Maybe better than fine. I didn't know a thing about him at the time, but I was sad for him and for his family and friends, whoever they might be. As our team braced itself against the uncomfortable conditions on the ridge, discussing options for bringing the man's body down the mountain, we all noticed a rather sudden drop in the wind. So, in an attempt to take advantage of the improved conditions -- however long they may last -- our Coordinator made a call to DPS and, within a short time, we heard the helicopter approaching. One of the best pilots there is, anywhere, hovered, the helicopter visibly shifting and swaying, buffeted by the gusts that were still plenty strong, as he and his medic assessed the situation and those of us on the ridge hoped aloud that this alternative would work. And it could, the pilot said over the radio. The winds were too strong for a short haul, but he would go land down at Snowbowl, remove a door, prepare the cargo net, and burn off some fuel, then return to hover over our location. Still, nothing was certain until that actually happened.We took shelter on the lee side of some boulders as we waited for the helicopter to return. If the cargo net maneuver didn't work, then it was back to plan A or B or ... well, something much more difficult. In less than an hour, the man who'd died on Humphreys earlier that day was air-lifted from the mountain, as those of us who'd gone up to help began making our way down the long way. That wasn't the only time this latest Memorial Day weekend that our SAR team was called to Mt. Humphreys. The night before the body recovery, on Friday, May 25th, several of our members rescued some hikers from the saddle who were unprepared for the cold. Another group was rescued from the nearby Kachina Trail. Our K9 team was also busy over the weekend, after hikers found a human skull at a small campsite in Forest Lakes. Handlers Cindy and Dianne and their dogs were called to search the area and eventually located 26 more bones and other evidence, but there was no vehicle around and no ID was found. Sheriff's office investigators are asking for the public's help to identify the man based on items located. Investigators believe the man had a 44-inch waist and wore double-extra-large size shirts. A Bass Pro Shop hat and a tan hat with a red diver's symbol on it were also found, as well as a Harley Davidson bandana, red Peterbilt suspenders, fishing waders and a green 5-gallon water jug. The man was possibly last wearing a tan T-shirt and blue jeans. The sand-blasting lasted less than a minute as the helicopter lifted off, and then it was quiet. Very quiet and still, save for a distant tweetle (of a Canyon wren perhaps) and a curious fly buzzing my ear. I stood there for a long moment, taking in the silence and surveying the scenery. We'd been dropped off on what seemed like an island, on a shelf between the Esplanade high above us and the Redwall cliffs below. This was my third day on what had been, so far, a weeklong search for an overdue and very experienced canyon hiker. Today was his 66th birthday, and I was hoping to wish him a happy one ... or that someone else would at least. Was he out here somewhere in this vast, rugged, incredibly beautiful landscape of colorful rock layers, cactus and cliffs? If anyone could survive out here, he could. But for how long? Or was he long gone maybe, alive and well out of the area? Lots of scenarios had passed through my mind and in the minds of other searchers over the past week. My teammate broke through my thoughts and the silence. "You can search the inner part," he said. "I'll go out near the edge." He knows I'm not fond of edges when I'm not on a rope. We both hoisted our packs, heavy with water, and began walking slowly through the cactus and desert brush, studying the ground and stopping frequently to look around for anything that didn't look "usual"--a color that might catch our eye, bird activity. Any kind of sign that another person had passed through the area. We were also listening and looking carefully for rattlesnakes. Both "pinks" and "greens," the latter being the very deadly Mohave rattlesnake, had been seen (and heard) during the search. These were some of the most difficult tracking conditions I'd encountered, not just the rocky and coarse, sandy substrate but the fact that wild horses and other critters had tramped all over the place, not just here but also the bottom of the canyon where I'd searched two days earlier and on the Esplanade, where I'd searched two days before that. Add the age of some of the tracks we had encountered during the search, and I really had to go slow, look around at the same spots from different angles and literally get down on hands and knees at times. My teammate and I occasionally consulted with one another: "Is that a footprint or a hoof print?" Actually, sometimes, in some conditions, it's hard to tell. We searched our canyon island from end to end, looking carefully at the "pinch-points" to the north and south, where someone would have to have walked in order to get around the side canyons, the heads of which left little room to negotiate the dropoffs. No signs of human prints or other evidence. We took a break in the shade of a large overhang, careful to check there too before sitting down, in case someone else had also taken respite in that cool, cozy nook. But again, nothing. We watched a single, circling vulture, but the bird soon moved on and circled somewhere else. And we found nothing more before the helicopter came back for another sandblasting, to pick us up and fly us back to Incident Command where we converged with other field teams. No one reported any new sign on this particular day. But as far as I heard at the last general SAR meeting, there is more searching to be done, to follow up on sign found by a Park Service employee who was helping with the mission. I'd seen him when he started off at the head of Mohawk Canyon, prepared to be out for as many as six days. He was one of several canyon experts who's assisted the Sheriff's Office and our team with this search. My teammate, Steve, searches on the Esplanade. I had just received my Inland Search Management class certificate the day before, on Friday. At 4:15am Saturday morning, my phone beeped me awake with a text message then rang moments later. It was a call-out for Operations leaders to respond to the SAR building regarding a search for a missing person -- my first call-out as one of those Ops folks. Also the first to show up, I found a note on our Coordinator's office door, saying he'd gone to the main Sheriff's Office building -- something about picking up information regarding the subject's recent cell phone activity -- so I waited. I wasn't sure what the procedures were for our team's Ops volunteers as opposed to what I usually do when I arrive for a regular call-out. But two, more experienced Ops leaders walked in within minutes and put me to work. Then our coordinator returned and gave us a short briefing. While I shouldn't ... well, can't ... give many details about the search (I have to remind myself of that sometimes), I can say it was fun (probably politically incorrect but true) coming up with various scenarios and working on plans for the search. Shortly after our SAR Coordinator had briefed us on the situation, I'd been instructed to call one of our volunteers who lives in the area of this search, which was a good distance from our base in Flagstaff. This searcher is often notified directly when there's SAR activity in his neck of the woods, so he can get a head start as he did this time, heading out to meet with the RP (reporting party) and drive some roads in the area. He knows those roads well. Next, I helped prepare a briefing packet for the Initial Response, and then several of us leaned over maps that had been spread out on the conference room table, at times our heads nearly touching. Cell phone information was plotted on those maps, fingers followed contour lines and Forest Service roads, distances were measured, and scenarios hashed out and re-hashed. Not long before the general call-out was made to the rest of the team, two of the Ops leaders -- also regular members of the unit, like I am -- left for the search area. They would eventually rendezvous with our volunteer already down there and assist with the "Route and Location Search," which is what we're calling a hasty search nowadays, based on what we'd come up with as the most likely places the subject might be found. I'm happy to report that the information gathered in the initial investigation, combined with the scenarios and plans that were formulated back at the SAR building and the quick response from our volunteer in the area, the subject was located and in good condition. I was also able to attend the next call for Ops leaders just days later, to discuss a potentially very complex search in remote, rugged terrain. I didn't say much at that meeting, except when asked directly for my opinion, but I found it really interesting to listen the other, more experienced Ops leaders and law enforcement/SAR personnel talk about scenarios, logistics for getting a large amount of specialized gear and personnel into the area, and weigh the risks against the quality of the information -- or lack thereof -- that was available so far. Yep, I really find this SAR Ops stuff fascinating. Although I already knew quite well what goes on "behind the scenes" of a SAR mission and what's involved in more extensive, multi-operational period and multi-agency missions, the Ops classes I've taken so far have really reinforced the knowledge that there's so much more to SAR than people just showing up to wander around, looking and how important it is for as many people as possible be trained to work within the Incident Command System, particularly for large, complex situations. It also drives home the message that taking the time to properly investigate and plan a search, as opposed to just rushing out to the field, can really save time in the end and get the missing subject found sooner than later. Our own Cindy McArthur received word from NASAR Canine Committee Chair, Ann Christensen, that her dog, Nitro, who passed away earlier this year, has been selected to receive the NASAR Canine of the Year award. Christensen stated, "This year, we were very fortunate to have a number of deserving canines nominated for this award and the competition this year was stiff and the decision difficult," but, in the end, Nitro was chosen for his years of excellent service to the SAR community. Nitro will be honored and the award presented at the 2012 NASAR Conference Closing Award Ceremony on Saturday, June 9th at Lake Tahoe. The 2nd annual Arizona K9 SAR Conference, held here in Flagstaff, AZ, just concluded this past Sunday and, once again, was a great success, with more than 60 handlers and their dogs attending. We're looking forward to more of these educational training events in the future.